Bloating…..after a great workout….really? You take off your clothes for that blissful shower, and the euphoria comes crashing down because that endorphinated workout gave you a bloated belly? That 6 months pregnant look was great when we knew the reward was a baby, but that’s not the look we’re after now. All we can think is $#*#^<$????? what did I do to deserve this? Ballooning, belly bloat….let’s be honest is perhaps one of our greatest frustrations. We try to eat right, exercise, we’re health conscious – and this just seems “not fair”. We just don’t know when it strikes, and of course it always seems to be the worse possible time – because the truth is its never welcome and makes us think, what did I do wrong. True, bloating can happen for hormonal reasons, digestive issues, allergies & intolerances….. but putting these aside – let’s take a look at every day activities that can make us crazy. The great news is, by adjusting these bloaty habits, we can also physiologically Destress our lives and…the kingpin of all…….help prevent cancer. 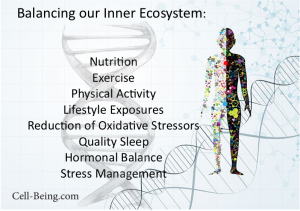 Let’s remember that all of us have cancerous cells, and the goal of good health is to create an inner biology that starves and shuts down mutated cells (cancerous) and promotes the reproduction of healthy cells. This might sound far too simple, but most people do not breathe properly, especially while exercising. “Valsalva” (holding our breath) during exercise cheats our exercise by driving up blood pressure, deprives our exercising muscles of vital oxygen and can lead to headaches, even strokes. The Valsalva maneuver can happen in any day to day strenuous activities including bowel movements & childbirth. The valsalva builds air pressure adding extra force to the activity, which is why we do it unknowingly, however, it is potentially deadly. An exerting muscle denied of oxygen cannot accomplish the desired gains….Breath holding & hyperventilation (rapid shallow breathing causing more exhalation of carbon dioxide than inhaled) both lead to bloating, intense physiological stress, and cancer cells can survive a lack of oxygen much better than healthy cells. Most of us do not drink enough water, or we drink most of our water with meals…which is actually when we should drink less water. Our bodies hold on to water with the threat of dehydration. During exercise, we lose water to sweat, water is forced out of of the kidneys and liver, causing bloat. Drinking water regulates sodium levels and regulates bowel movements. However, I feel compelled to mention here Hyponatremia (low salt levels from dehydration or over hydration causing an imbalance (dilution) of electrolytes) is a serious threat to cancer patients. Cancer fatigue, common in cancer recovery, is seriously worsened by dehydration….the right amount of hydration and balance of electrolytes is important to all and yes to cancer recovery. An even slightly dehydrated body produces more of our stress hormone cortisol. One of the very first ways to come out of a stressful situation is to deep breathe, and rehydrate. Normal cells cannot live without oxygen, cancer cells can thrive without oxygen. Water transports oxygen to the cells, and is responsible for ridding the body of toxins. Toxic build up can cause damage to the DNA and ultimately mutant cells. A healthy body is slightly more alkali. As a body dehydrates it becomes more acidic – which again is more favorable to cancer formation. Dehydration suppresses the immune system, and the production of white blood cells (major fighter of cancer cells) in the bone marrow. We cannot prevent cancer without our immune power. Exercise for cancer recovery & the go forward prevention of metastases is NOT the same as exercise for fat loss, body building – there are a number of differences that must be respected to reap the rewards of cancer exercise training, and not create unknowingly an inner biology that fuels cancer growth. 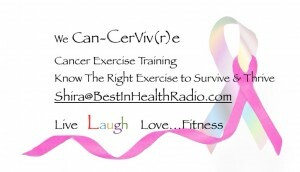 Exercise is a vital necessity to cancer recovery, but can be a source of oxidative stress. Look into digestive disorders- get checked out and eliminate this possibility. As we all know many digestive disorders are emceed by bloating. And certain digestive disorders can lead to cancer. Example: the H Pylori bacteria – unknown to many of us – we are hosting this bacteria in our gut. It can cause many uncomfortable symptoms – however it has now been linked to gastric cancers. There is an increased risk of colorectal cancers in those with Crohn’s. People with celiac who do not eat a gluten free diet run a great risk of certain lymphomas and gastric cancers. It is estimated 80% of those with celiac go undiagnosed. And yes, celiac can cause tremendous abdominal bloating. Belly bloat can be something simple & temporary, but it can also be a sign of many illnesses, including a number of cancers and digestive disorders. It is never for any of us to diagnose ourselves. It is a really good idea to track when we bloat – what we have been eating, our activities, find patterns…..This information provides important data, but never come to conclusions and diagnose ourselves. I personally believe we all need a good M.D. and N.D., both can provide vital insights into health. But hey, if we can destress, banish bloating & prevent cancer – we provide ourselves a trifecta of good health, energy and happiness. Thnx a lot 4 posting the interesting information! if u able to keep up your fantastic job i’ll follow your posts.